Tokyo's Ueno Onshi is the oldest park in Japan, designated by the Japanese Cabinet in 1873. A favorite spot for cherry-blossom viewing, it is also home to museums, art galleries, a library and a zoo -- one of only a few combined cultural precincts of its type. While simply walking around this large park is enough to give anyone a good workout, there are relatively few benches, and visitors should assume that they won't be able to find a seat. Even if you are lucky enough to find one, however, you probably won't feel like sitting there for more than a few minutes on account of the unusual shape of the benches. The bench in the photo below, for example, has a sturdy steel partition in the middle of it, meaning the user has to sit up straight. The seat also slopes down so one has to brace one's feet against the ground to stop falling forward. A man has a hard time getting a break on this partitioned, forward-leaning bench at Tokyo's Ueno Onshi park. Other benches in the park are too short to lie down on (see below, left). In some cases, there are protrusions placed on what might otherwise become a makeshift bench at one-meter intervals to prevent people from stretching out and getting too comfortable (below right). Left: A man tries to sleep on a deliberately shortened bench at the park. Right: protrusions prevent visitors from lying down on potentially makeshift benches. 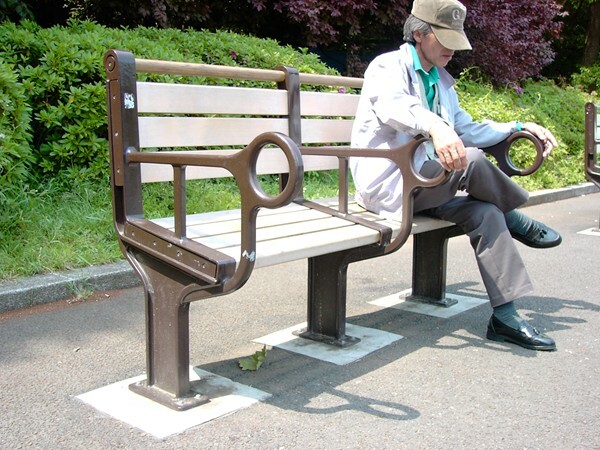 It is not only Ueno Park where this is the case: similar, unusually-shaped benches can be found in any large park in Tokyo. But why? For the answer to this, we must understand that Ueno Park is also famous for something else. If one ventures into the middle of the park, one will find a cluster of blue tarpaulin tents, belonging to the homeless people who reside permanently in the park. Here they sleep, cook on gas stoves, wash their clothes with the park taps and even keep cats and dogs. According to the Tokyo Bureau of Construction, there were over 150 tents in December 2005. It is said that if one counts those homeless people who don't pitch tents but rather bring pieces of cardboard into the park at night to sleep, there can be over 300 people sleeping in the park on any given night. A 2005 government survey found that there are 25,000 homeless people in Japan. It is said that 5,000 of these live in the greater Tokyo area. While people become homeless for different reasons, unlike in Western Europe, the main reasons for homelessness in Japan are not unemployment, divorce, drugs or other urban problems. For the reasons we need to go back to the period of rapid economic growth of the 1960s. A great deal of labor was required to put in place the urban infrastructure for the 1964 Tokyo Olympics. For the government, successfully staging the Olympics was the ideal chance to show the world how well Japan had been rebuilt and modernized after the war. Ueno Park as well as the other large parks around Tokyo became a market for "labor sharks" from gangs, and rampant market for the illegal practice of scouting for laborers off the streets, with men gathering from all around the country in search of work. These men were made to lodge together, with many of them occupying a single large room. Most of their pay was "skimmed off" under the guise of agency fees, accommodation, and money for meals and cigarettes, leaving them with almost nothing. Japan's period of rapid economic growth eventually came to an end, however, and when the "bubble economy" collapsed in the late 1980s/early 1990s, these casual laborers were left without work and became homeless, staying in Ueno Park and other large parks, shopping districts and riverbanks around Tokyo. This was not restricted only to Tokyo: Osaka, now the city with the biggest homeless population, was converged upon by laborers from around Japan to lay the infrastructure for the 1970 Osaka Expo, and Yokohama began serving as a labor market immediately after the end of WWII for dockworkers who loaded cargo for the U.S. Army. These workers were all behind-the-scenes players in Japan's rapid economic growth. As casual laborers from this period -- discarded when industries were restructured -- make up many of Japan's current homeless population, the average age of the Japanese homeless people is 55.9 -- higher than elsewhere. In all the large parks in central Tokyo that once functioned as markets for casual laborers and now serve as beds for the homeless we can find the same kind of benches as in Ueno Park. These benches are actually designed to drive homeless people away, and were introduced by metropolitan and civic authorities in response to complaints from citizens. While fitting benches with partitions is the most popular way to stop people from sleeping on them, there are many variations on this theme, such as using arm rests, placing protrusions along the edge of grass verges, or even using one-person seats instead of benches. The bench in the photo below may appear to be of modern design, but because of its tubular construction one risks sliding off if not careful. One should be especially careful if drunk at the time! Made of stainless steel, the benches are hot in summer and cold in winter. The Toshima-ward parks office, which oversees Ikebukuro West Park, home to this bench, describes the bench as "designed to keep with the modern image of the area while at the same time not allowing homeless people to loiter." Suggestions that the benches were dangerously slippery and also uncomfortable met with the advice that "people should take the utmost care when sitting on them" and that these benches were only something to lean on or sit on for a few minutes. That is, they want us to regard the bench as "somewhere you can sit if you have to." It makes you wonder who would actually want to sit on such a bench. 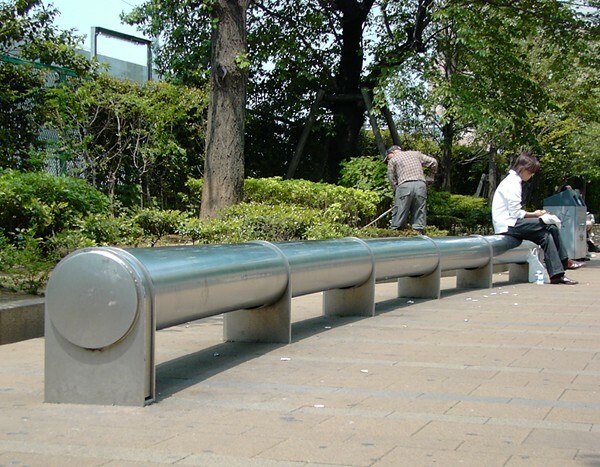 The hard curved surfaces of this stainless-steel bench, too hot in summer, too cold in winter, repels all but one visitor to Ikebukuro West Park. I would like to make it clear that I do not believe homeless people (or anyone else) have the right to occupy park benches day and night. At the same time, though, I do not believe the growing unfriendliness of Tokyo's park benches can be left to go on unchecked. At the rate things are going, it will soon be impossible to even change a baby's diaper on a bench, as babies cannot be laid down on tubular benches or those with partitions. Even ordinary members of the public who want to lie down on a park bench with a book on a sunny day are having this simple pleasure taken away from them. In fact increasingly these days when old benches are removed they are not even replaced with new ones -- rather, lawns or gravel are simply laid in place of the old bench. Perhaps benches themselves will one day disappear completely from our parks! It is obvious that simply modifying the design of benches will never be a fundamental solution to the problem of homelessness. I believe that rather than trying to make designs more advanced, governments should put taxes to more constructive uses. In order to solve the problem of homelessness, Tokyo prefecture and the central 23-ward metropolitan area began in 2004 an "independence system" for homeless people. This involves accommodating homeless inhabitants of Tokyo parks in "independence facilities," and supplying them with meals and advice on life and employment, thereby helping them to become independent. However, residents can only stay for two months and there is only enough capacity for 510 of the approximately 5,000 homeless people in Tokyo, meaning that in reality the system is not very effective. Uncomfortable park benches are not the only devices to repel the homeless. Kyoichi Tsuzuki, an art magazine editor photographer, says that devices to expel the homeless can also be found in the field of public art. Take, for example, the works shown in the photos below. The underground walkway extending from the West exit of Shinjuku station in the direction of the Metropolitan Government Office is full of colorful objets d'art. However, not only do these have slanted tops, but they are interspersed in alternating rows, meaning one cannot lie down or even sit on them, despite their apparent "function." One cannot sit on these colorful "artistic" objects, strategically placed to give the impression that one can rest but having the opposite function. 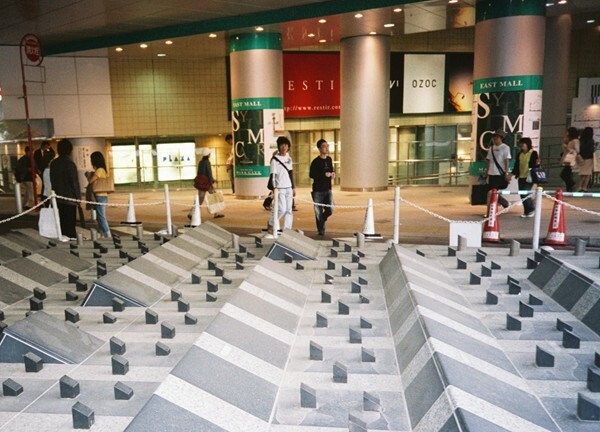 Shibuya's Wave no Hiroba Plaza (below) is obviously designed to drive away the homeless, rather showcase a work of art. While one can kind of understand the wave shaped undulations (a play on the name of this square), how does one explain the thousands of protrusions embedded into the work? Shibuya's Wave no Hiroba Plaza. The photo below of a sculpture plaza was taken below a pedestrian overpass near Oomori station. The homeless people who used to live there have been driven out to make way for the penguin and dolphin "sculptures." Shibuya-ward, which manage the area, state that the sharp, painful-looking stones represent "ripples." 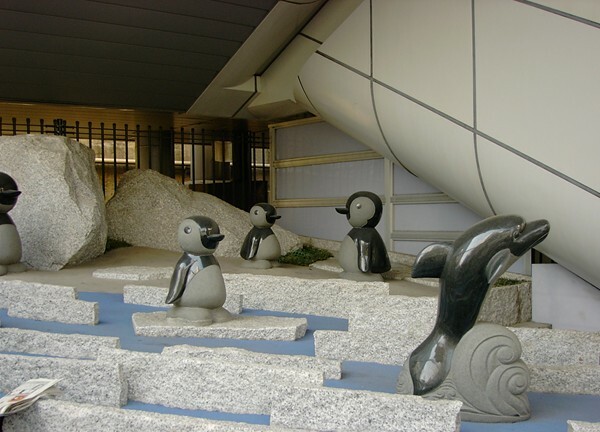 These seemingly innocent penguin and dolphin "statues" are designed to repel rather than attract in Shibuya-ward. Tsuzuki says local governments are careful to disguise the ill intentions of their methods--the trick is to stop people from noticing that the works are in fact "anti-homeless" art: "While on the one hand I find it obscene the way that art -- something that is supposed to enrich people's lives -- is being used to exclude a specific group of the community, at the same time the behavior of both local governments and the homeless strikes me as unenlightened, if not dim-witted. As local governments could not get away with driving away homeless people by simply erecting edifices embedded with fragments of glass, they disguise them as "new designs" and build objects unworthy of the designation "art" in city centers. For their part, the homeless would occupy benches all day, and did not share the basic value that public places are for everyone, which is why they eventually had to be driven out." To find out what homeless people themselves think of these "anti-homeless" benches, I took a survey of some homeless people living in Tokyo. "innovators," who would lie folding their bodies into a V-shape around the central bench divider, or placing bags on either sides of the divider at the same height, or even placing a camping stove underneath the stainless steel tubular bench above to cook and at the same time warm the bench! Out walking the other day, I stopped by at the nearby Kishibojin Shrine for a rest. There, too, I found only stone benches fitted with sturdy partitions down the middle. "Anti-homeless" benches are now no longer restricted to just parks but will soon spread to every public space imaginable.